A great but controversial defender from England, Rio Ferdinand has been known as a defender with great positional sense and oftenly shows composure on the ball.However, he's also infamously known for making numerous blunder due to either lacks of speed or lapse of concentration. The former West Ham United and Leeds United player joined United for around £30 million, a British transfer record for a defender, in July 2002 and has won almost everything there is to win in the club game: the Premier League, Champions League and League Cup, although he missed out on United's FA Cup win in 2004 due to a suspension for missing a routine drugs test. 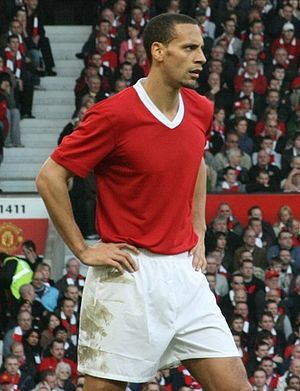 At international level Ferdinand has established himself as first-choice centre back under successive England managers but it came a long time after making his debut at the age of 19 years and 8 days as a substitute in a friendly against Cameroon on November 15, 1997, making him the youngest defender to play for England at the time. A lack of concentration curtailed his fledgling England career but, since maturing, the Peckham-born player has been to the 2002 and 2006 World Cup tournaments and was given captaincy of the side in February 2010 after John Terry's was stripped of the title. But further injury problems, which included missing out on the 2010 World Cup saw the Three Lions armband handed back to Terry.